Editor's note: in the original book this has the code 305-6. 7.
assists electrician (theatres, music halls) q.v. an electrician who attends to repair and maintenance of electric bell lines, pushes and batteries in mines. fixes in position and maintains electric lamps used in cinema studios; manipulates switch-board during production, and is generally in charge of preparation of lighting effects in scenes. an electrical fitter q.v. who fits up, and erects in position, controllers used in connection with electrical machinery, especially of electric cars in tramway or railway depot; also repairs controllers by adjusting, or renewing, working parts, using pliers, screwdriver, spanners, etc. (ii) (tramways) superintends and controls electrical work in connection with tramway rolling stock, permanent way, cables and overhead trolley wires, and electric power supply machinery. an engineering fitter (210) q.v. engaged in making, adjusting, erecting, or repairing electrical appliances, apparatus, or machinery; more particularly heavy machinery, such as dynamos, alternators, switchboards, etc. a maintenance man, who keeps lighting and power circuits and plant in working order; attends immediately to any breakdown in electric lighting or power circuit, e.g.. renews blown fuses, replaces worn brushes on motors. 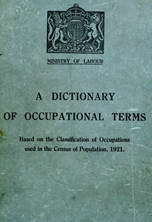 term not officially recognised in Post Office classification; a man so describing himself might be an electrical fitter q.v., a wireman (311) q.v., a "skilled workman " (311) q.v., etc. instals wires, cables, generators, batteries, and other electrical fittings for lighting railway carriages; also fits telephones and electric bells in saloon carriages and compartments. is responsible for care of electrical plant by which a theatre, music hall, etc., is lighted, including special lighting of stage; carries out wiring, repairs, etc. examines electrical systems of tram cars to detect faults, which he repairs; sometimes (but rarely) does armature winding and repair of controllers. (ii) assembles switch boards, motors, dynamos, electric cranes, etc., in factory where made, for testing purposes. carries out repairs, in addition to performing duties of engine driver (950) q.v. fitter-erector, see erector. alters and adapt�, with lathe, screwing tools, and brazing tackle, gas and candelabra fittings to suit electric light. an electrical engineer q.v. skilled in installation maintenance and repair of wireless apparatus; erects aerials; tests installation for faults, and carries out any necessary adjustments and repairs; instructs wireless operators (754) q.v. in mechanical side of their work, e.g. tuning in and operating instruments; (at aerodrome) instals wireless apparatus in flying machines and in wireless offices.